There are several different degrees of club feet in horses (1 to 4; 4 being the most severe). Many can be helped with corrective shoeing. Some cannot be helped. Others may need an operation. Club feet can be in the forelimbs as well as in the hindlimbs. I have been told that club feet that are genetic usually come in pairs. Both front or both hind. If not genetic, "...an acquired flexural deformity develops anytime from 2 to 6 months of age due to a number of possible causes, such as nutritional imbalances, rapid growth, overexertion, and genetic predisposition. Generally, these involve the coffin joint. When managing these foals, restrict exercise to decrease trauma to the structures and administer non-steroidal anti-inflammatory drugs (NSAIDs) judiciously along with anti-ulcer medications since such drugs are notorious for inciting gastric ulcers in foals. Your veterinarian might administer oxytetracycline as well. The farrier can also apply an acrylic composite material to the horse's toe area to protect the front of the hoof; these are called toe caps. ..." How to Manage the Club Foot: Birth to Maturity Other causes of club feet are: A disease that causes swelling and pain in the joints known as OCD (osteochondrosis-developmental disease) and Developmental Orthopedic Disease (DOD) in Horses, Osteochondrosis (OC), Osteochondritis Dessicans (OCD), Subchondral Bone Cysts (SBC), diet, ephiphysitis (a problem that occurs at the growth plates of young horses). If not genetic, club feet do not necessarily come in pairs. 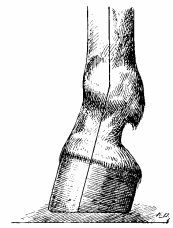 "Grade 1 - The hoof angle is three to five degrees greater than the opposing foot and a characteristic fullness is present at the coronary band due to partial luxation (partial dislocation) of P2 and P3 (the second phalanx bone and coffin bone). Grade 3--The anterior hoof wall is dished and growth rings at the heel are twice as wide as on the toe. Radiographically, P3 exhibits demineralization and lipping along the apex. Grade 4--The anterior hoof wall is heavily dished and the angle is 80 degrees or more. The coronary band is as high at the heel as at the toe and the sole is below the ground surface of the wall. Radiographically, P3 is rounded due to extensive mineralization and rotation may be present. For an excellent article on Club Feet in Horses follow this link: Club Feet in Horses by: Les Sellnow This article is comprehensive and well written, easy to understand, and covers all four degress of club feet. For shoeing a horse with club feet I would suggest following this link: Shoeing a Horse With Club Feet by Bubby Rhoderick, CMF I know Bubby and he has worked on one of my past horses. He has a farrier school in Maryland.